Whippet World • View topic - When do whippets go through adolescent phase? When do whippets go through adolescent phase? I'm wondering at what age people have found their whippets to go through the teen stage of puppy-hood? I know this will be different in each dog, I'm just curious in general. Re: When do whippets go through adolescent phase? Thanks! Best of luck with yours. This topic should be a good place to share photos. We have a long way to go till this is over. I think about 6 months you think you've got them trained and they're lovely little people, then around 8 months all that goes out the window and it's all teenage rebellion. Of course every one is different, but it's all there and thereabouts. I was really thrown this time. I have a 1yo pup. She was the perfect puppy. Don't get me wrong, she was naughty like they all are, but overall she was soooo much better behaved than most of my previous ones. With crating my goal is to start leaving them loose around a year, and in a couple of months have them crate free. She was so good that I started her at 10 months. She didn't touch a thing (I have 4 other adults). She was incredible. Within a week I was leaving her for a couple of hours and we didn't even think about it. She was great for 2 months. Then just before she turned a year I came home to something shredded that she hadn't even looked at from the day she came home. I figured it was a one-off. 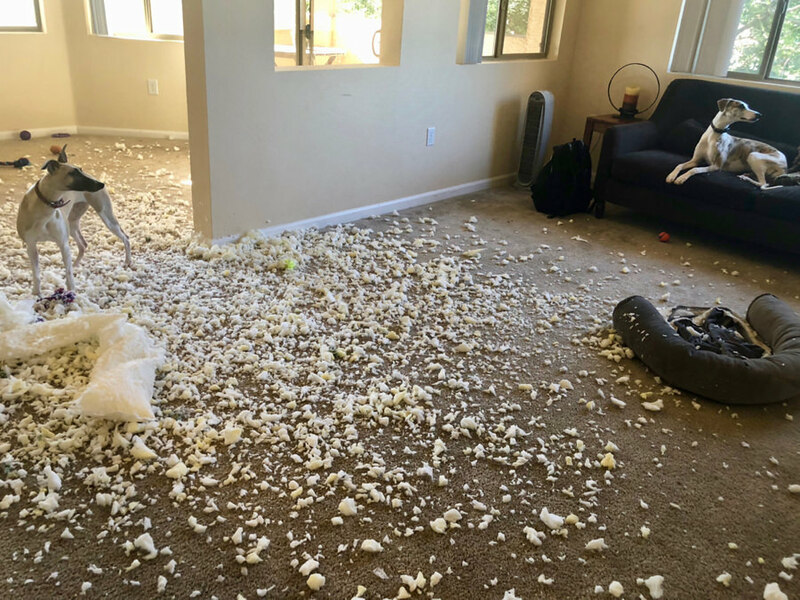 Next day, she's shredded a pillow. So back in the crate she went for a couple of days. Then Nick and I had to run out for half an hour. I thought maybe she'd learned her lesson, and left her out. I came back to a chewed brand new show - only worn once. She had NEVER EVER TOUCHED A SHOE before!!! WTHeck!!?? So she's been crated for the last few weeks again. She's not happy and makes me feel guilty every time I come home, but she brought it on herself. I was so excited to have a crate free pup before a year and I had almost taken the crate down (I didn't because one of my others had dislocated her shoulder and I needed it for her). And then BOOM! BAD PUPPY appeared out of nowhere! Adolescence hit hard! I've just yesterday left her loose for 2 half hour sessions, and touch wood she did well, but I'm not trusting her again for a while yet. I can see in her eyes that she's not through this phase quite yet.